I do have real asters that will bloom in a few weeks in my backyard, but today's are blooming on my card. Well, technically these are Black Eyed Susans, from the Mark's Finest Papers set Black-Eyed Susans for Encouragement. ;-) I think they make great asters! This is a CASE of my friend LeAnne Pugliese's card which you can see HERE. Her card is orange, but I picked my fave color - purple. I'm playing at Ribbon Carousel Challenge blog - my first time. :0) It's Anything Goes this week. Also playing at Flourishes' Bring Back Beautiful - theme is Monochromatic. Thanks for letting me CASE you, LeAnne! We went to Washington, D.C. for an overnight trip last week and I wanted to share some pix with you. My girls in front of the (currently non-tour-able) Washington Monument. The Wizarding outfit worn by Daniel Radcliffe, who plays Harry Potter. A crown featuring gems worn by Marie Antoinette. Biggest doll house I've ever seen! The Ruby Red Slippers worn by Judy Garland in "The Wizard of Oz." That was my oldest daughter's very favorite movie for the longest time. My husband next to Rutherford B. Hayes, US President. We visited Madame Tussaud's Wax Museum, which was a terrific tour! My kids think this President looks my husband might in a couple of decades. My daughter with Rosa Parks. My children have been adopted by The Kennedys. A bust of Marie Antoinette. Madame Tussaud was asked to make a death mask of her at the time of her execution. Honestly, doesn't Morgan Freeman look so real?? Me with Johhny Depp aka Captain Jack Sparrow. I LOVE Johnny Depp! Stamps: Black Eyed Susans for Encouragement - MFP; En Francais - Stampin' Up! very cool vacation pics:) and an awesome, pretty card, colleen! Your flowers are fabulous. Love both varieties so I'm covered ;) Great touch with the text in the BG and the embossing on the purple. Lovely card. Great pictures! Haley looks great and I'm loving the pic of you and Jack Sparrow :) Amazing wax replicas! First Colleen let me say how much I love those black eyed susan's in blue. The text background makes them look amazing. Second, I am so jealous of your picture with Johnny Depp. I always did like my men with long hair-longer than mine even and eyeliner-and let's not forget about the black nail polish hahahhaha.....I dated men who dressed liked that back in the 80's when the "hair" bands were popular like Motely Crue, Posion, and Snake. The era of spandex, hand cuffs, and fish net stockings. Yep can you believe it and it was one of the best times of my life!!!! Your husband does have a striking resemblem to the president....WOW uncanny! How fun-it looks like you and your family enjoyed yourselves. Great times and memories! Well, I am honored that you CASED my card--it is beautiful! I love how you stamped AND embossed the background. Gorgeous colors! And your DC photos are wonderful. I have been to DC many times but never any museums! Hmmm, I may have to remedy that--it's such a short distance away! I guess anything that involves traveling on 95 gets a "no" vote from me! 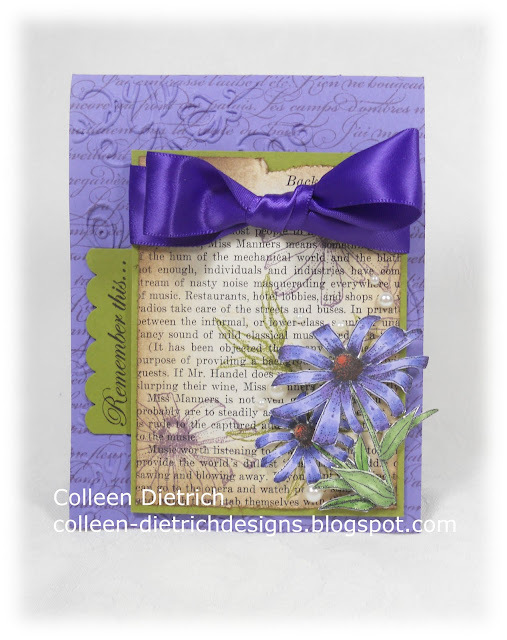 Beautiful case of LeAnne's card-love the purple and the asters. Enjoyed the tour-neat photos and Yes, Morgan Freeman's likeness is so on. You and Johnny Depp; cha-ching...even in wax form he's a cutie :) Love your card! The asters look great, especially the curled petals! Beautiful card, Colleen! I love the asters and the blue bow! It looks like you all had a blast in Washington, DC! Beautiful card Colleen! I love the purple and those gorgeous flowers! Love the double bow too! Your family pics are fantastic! Glad you got a fun family trip before the kids started school! Hopefully before the weather went bad too! What a cool collection of vacation pix, Colleen! Looks like all of you had a ton of fun. You look so glamorous with Johnny Depp, too!!! Such a pretty card. I love your purple "asters"!! And, hey, I played along with the Ribbon Carousel challenge for the first time today, too!! My mojo seems to have taken a vacation, so I had to turn to challenges (for the first time in a long time) for some direction. Anyway, your card is gorgeous! 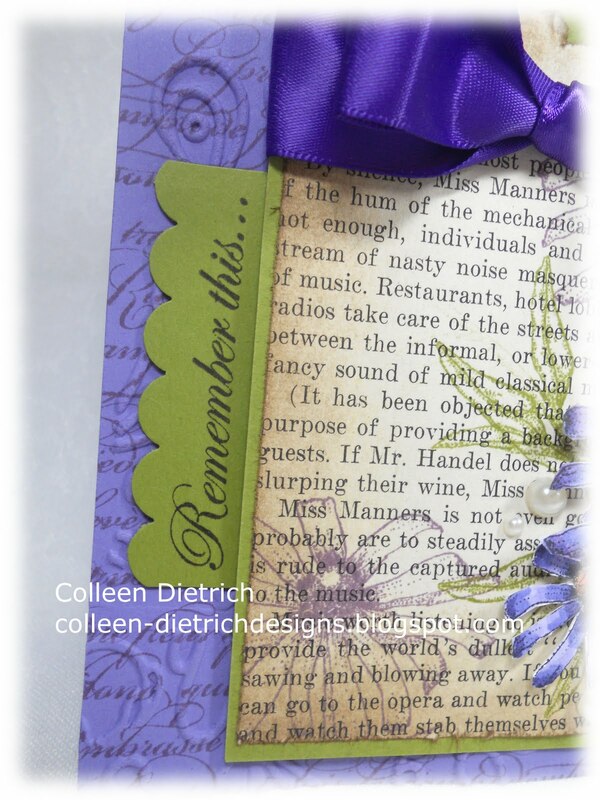 Love your Miss Manners text as background, and that fussy cutting you did is amazing. Great work!!! Cute pics Colleen - looks like a fun trip!!! Love your pretty card! Purple and green are one of my favorite color combos!!! Those vacation photos are great. I would love to Visit Washington D.C. some day.. That photo with you and johnny is great.. Your card is so pretty. Such a great design and I love that purple you used.. Perfectly beautiful asters on a lovely card! Love your porch. It looks so inviting! A trip to Washington DC is on my "bucket list". Looks like you had a great time. Well Miss Jack Sparrow :) you look great in that picture. This post has been lovely to read and to look at. Great family and lovely daughters. And your card; my oh my do I need to say more? I'm smitten....flowers, that amazing text stamp, a fab bow...sigh! Super card and loved viewing the pictures from your trip. Glad you shared. What fun pictures! I think the girls are right, Brian definitely bears a resemblence to Ruthie! Looks like you all had a great time! Your card is gorgeous, you've made such magic with those purple hues! It's just beautiful! Wow...this card is striking...and in a very good way. The colors are beautiful and those hand cut flowers are the perfect touch. Fabulous card! WOW! This is a beautiful card--love the lush beautiful purple ribbon! OHHH! LOVE it!!! I also love your family photos--love that you got a pic with Johnny Depp (wax)!!!! SOOOO fun! I love your card! And how is it that Johnny Depp can look so gorgeous even in wax?! Oh, how I miss the East Coast! Oh, yeah, back to the card...hee hee...Thanks for joining us this week at RCC! Fabulous card, but your pictures steal the show! Looks like you all had so much fun! And that wax museum... WOW and a bit creepy at the same time! LOL! Absolutely gorgeous card Colleen and the pics are fabulous!!! :) Thanks for playing the Bring Back Beautiful Challenge! !